They come in all kinds of shapes (although most are rounded), sizes (usually smaller than your head), colors (the full rainbow range, and more...) and with distinctive fragrances, textures....& of course flavors. They do not need any extensive promotions nor advertising gimmicks. They actually grow everywhere around you , even in many home gardens ! Otherwise they are found near eateries and shops including most backStreets. Some have found their way overseas to universal gluttony fame. These are some of de contestants for Ms Delectable Tropics 07 Malaysian Edition, part 3. Slightly sweet, crunchy and grainy with hundreds of indigestible hard seeds embedded onto the juicy insides. Claimed to have more Vitamin C than equivalent imported orange. 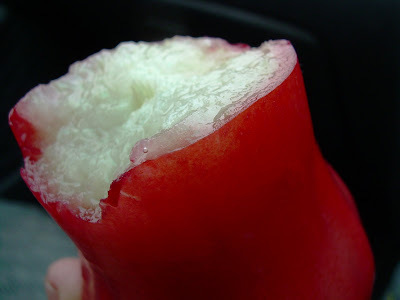 Usually eaten with salt or powdered preserved plum. 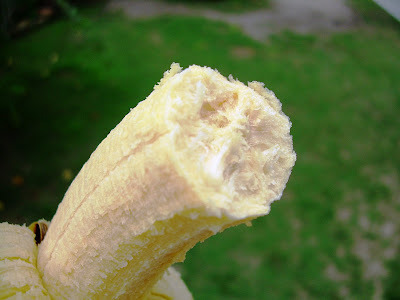 Some prefer to eat the insides together with the seeds ! The 'Star' herself. Some big some small mostly mild mannered and demure. 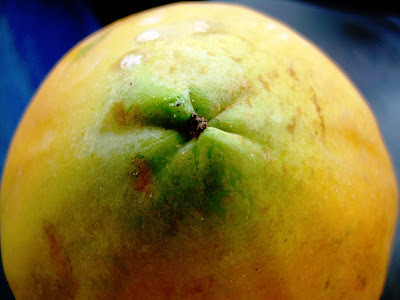 Sweet, juicy and slightly fragrant when ripe ( as for Guava). A few flattish slippery seeds. The amazingly sweet and sourish mango. Many species/textures/sizes and wide ranging flavours. 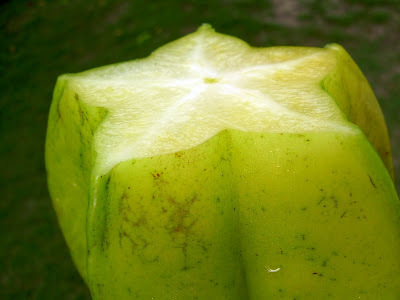 A runaway favourite for many when eaten unripe with salt, chili padi and sugar ! de classic papaya. Notoriously soft with black seeds so bitter birds must spit them out at one go ! Xtraordinary fine taste with just a dash of lemon juice. Loaded with vitamins A to Y. Associated more with matured ladies. Needs no introduction. 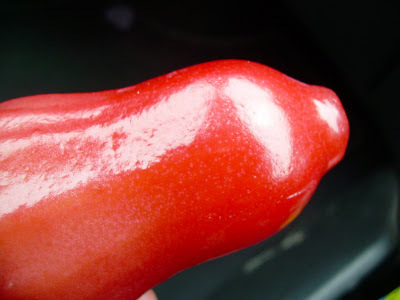 This is a miracle fruit claimed to prevent constipation forever ! A wonder food for most including the hyperactive monkeys, & much sought after in Indian & Indian Muslim restaurants. Regularly featured in Men's magazines for some not-so-strange reasons. 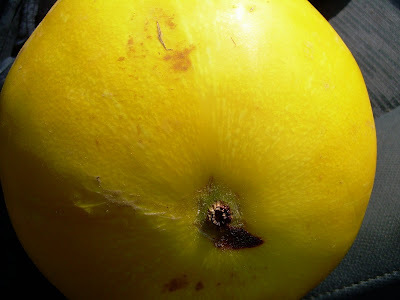 This 'jambu' is one of many varieties with a rather mild taste and cracks easily under pressure. A very hardy tree with millions of fruits but a big problem with pests. Found abundantly in Bidor too, by da roadsides. mildly crunchy it is quite juicy tho only a little sweet. Now it has become seedless too ! Great even for infants ! The slim tall bent tree of this delightful plant represents a picture perfect Tropical Holiday by da Beach in almost all international Travel Brochures. 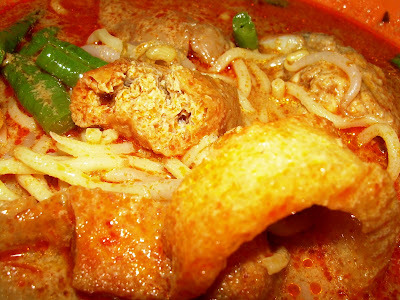 Without this marvel Malay/Indian/Nyonya food will never be da same again. And we are not talking only about nasi lemak ! With Xtra hard Xterior and surprise of surprises a full 300ml cup of sweetish water in de interior shell ! Even the fresh young flowers can be tapped to produce a mildly high wine called toddy. 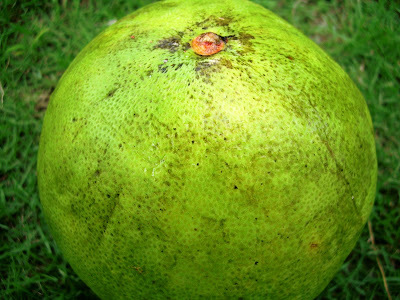 This one (pomelo) is famous in Ipoh and bears a striking internal visual resemblence to the orange family. It is quite big by orange standards and can be as big as a grown -up human head ! The thick spongy skin is sometimes used to cover two certain female body parts for fun. Not particularly sweet nor aromatic it survives more as a Festive/Chinese New Year Gift. 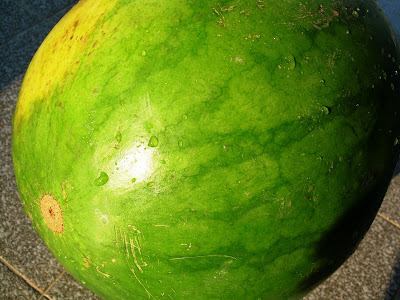 Da watermelon, so called because it contains lots of sweetish water. So commonly served as a chilled drink. A few versions and colors are possible even rectangular ones ! Some Chinese avoid this as they believe its is overly 'cold'. Others think the overuse of pesticides on this rounded teaser could pose a health hazard. Occassionally there is a bumper harvest ( or ?) where the prices can plummet to less than a Ringgit a kg. 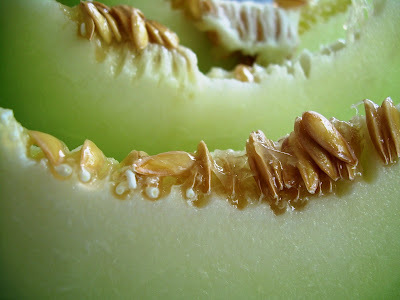 Honeydew, a misnomer since isn't it a member of the melon family ? 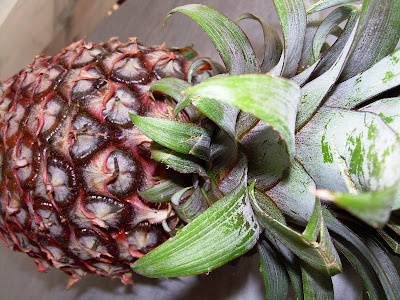 Popular too in many food stalls as its slight greenish crunchy texture is firmer than the watermelon. The rockmelon even tho it doesn't look like a rock. Infact the interior (pix) looks more like a deep tender mysterious hole (deja vu ?) surrounded by sharp valleys ! 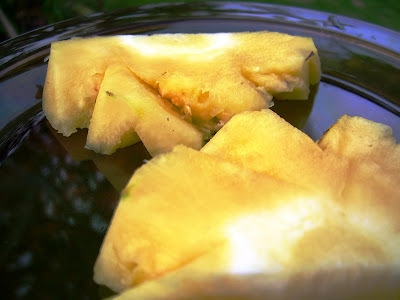 No wonder people frequently mistake this for the honeydew being remarkably similar in looks, texture and even taste. However these 2 really have a record of inconsistent tastes and many are frequently disappointed. Ms Delectable Tropics 07 (part 3 )? i only like guava and mango. the others don't like them! oh and also green apple. and do you know i take turnip raw as a fruit almost daily after dinner? well i alternate with green apple. I miss tambun pamelo so much..It's a treat during chinese new year.. 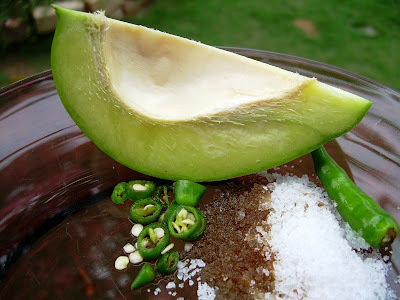 Since it's Visit Malaysia Year, I think your post should be used to promote local fruits! Oh by the way, i have tried eating the pomelo skin (white part) in HK, they stewed it with superior stock and dried scallop. Very very very yummy. 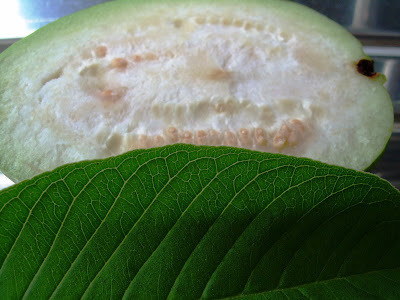 eh, isnt honeydew melon a melon? it is called melon what. percious pea, i've always felt it such a waste whenever i threw away the pomelo skin, afterall, it probably takes up 30% of the weight...and pomelos are so darn exp for a local fruit. Chief - there is this white empty space below your post...I think you need to delete the white space below your post in the blogger. 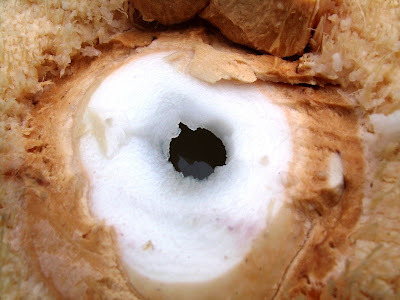 I love coconut juice to no end...the best thirst quencher ever! I took a movie of an Indian vendor whacking the coconut to extract the juice and the flesh...with pig huge shiny and sharp parang...it will serve as a great cultural guide to foreign tourists I am sure! Will post once I edit. Quite limited selection. Are these the finalists? fatboybakes, exactly what i felt too. While we treat it as rubbish, i remembered we were highly charged on this dish. 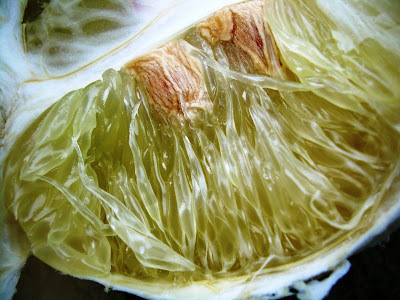 Hmm...maybe i could be pomelo skin supplier huh? aiyaaaa ... i'm waiting to vote for Mr Delectable Tropics leh .. where is my favourite "lu lian" ? mind you, i dunno why we dont cultivate avocado here, coz it IS cultivatable in our climate. one of our friend's farm has loads of it... and in bali oso, plenty. hm..king = durian.. on the other post... queen of fruits is which fruit? mei yen, no lah, they not selling their avocadoes. try to plant la. i have an avocado tree at home, but i think it's male...no fruit one. hei, where is my durian? Nice review of Malaysian fruits. But yeah, as xiu long bao said..where's durian? Does mangosteen counted as local fruit too? ya u r right ! must be really interesting to be eating those pomelo skins ? dun think avaiblable here in Malaysia ? u r probably right since ppl normally say H-D but never melon ! pomelo is worth its weight in skin thats why can't sell much in KL ? issit ah ? So r u or pp gonna cook it soon? Thoz da skin shud sting one's mouth like lemon/orange do ? maybe thats the kick ! tks for info, since adjusted. 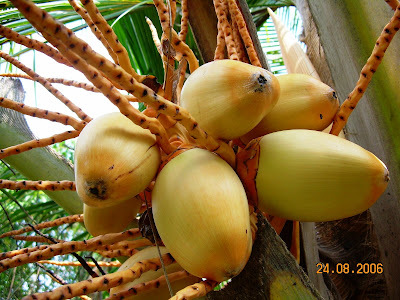 V wait yr Xciting parang/Indian man coconut post ! short but sweet, see part 2 below and 1 soon ! avocado it issn't but yes why not ! durian see below, queen I thoz is u ? finally yr new blog ! Wonderful now everybody can drool. mangosteen yes indeed it is and v v sweet and a favourite too for many! 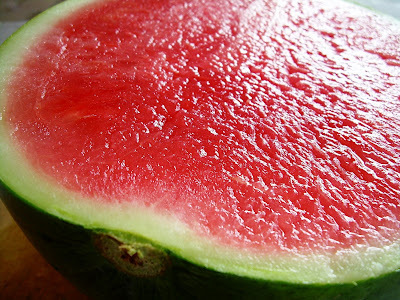 and your watermelon so so so red and delicious looking! 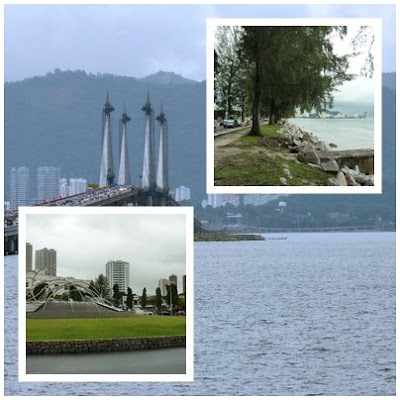 when u comin' KL area?